A Transformers groom’s cake: more than meets the eye. This is a conversation with my brother half a year ago, shortly after he and his fiancée asked me to bake their wedding cake. Keep in mind that I am not artistic, had never baked professionally, or really decorated a cake. My cake specialty up until then had been pound cakes baked in bundt pans and dusted with powdered sugar. Sometimes I made carrot cake. They were tasty cakes, but unlikely to impress wedding guests. Brother: Did you know that there’s also a groom’s cake? Brother: Can you make an Optimus Prime groom’s cake? Me: Um. Well. I could make an abstraction of an Optimus Prime cake. Brother: You mean…like a bunch of circles and squares? I thought about it. Then I thought about it some more. As long as I stuck with the chest up, the only problem with Optimus Prime was the elaborate head. The rest of him really wasn’t that far off from a bunch of circles and squares. So I ordered the Playskool Mr. Potato Head Opti-Mash Prime (“More than meets the fry”) and planned a cake around the helmet. This was the result. The base, helmet, ribbon, exhaust pipes, and nail polish-painted lights were not edible. Everything else, including the fondant and pastillage head, windows, and chest, were. They wouldn’t be tasty, but you could technically snack on them with your afternoon tea. I had originally hoped to make Optimus Prime’s head out of cake so that my brother could eat it with a spoon, but time constraints and the crazy decision to make this a secret groom’s cake made that too difficult. The secret was a success. He was surprised. 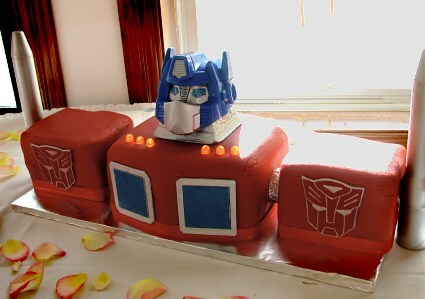 Or at least he was once it sank in there was an Optimus Prime groom’s cake. It took time for the denial to pass. I had planned thousands of words on the ordeal of making a wedding cake for the first time, but now that it’s over, my brain is in a state of quiet, transcendent peace. Or…I’m sleep-deprived and loopy from the marathon of baking, bridesmaid duties, and dealing with hordes of family traveling into town for the weekend. One of these days I may write up a primer for amateurs baking a large cake for the first time, but in the meantime, here is my brother and his brand new wife’s wedding cake. It was far from perfect, and there are certainly things I would do differently if I could do it again, but I accomplished my three main goals: to fulfill the bride’s vision, create moist and delicious wedding cake, and provide enough cake so that guests could eat as much as they liked. The bride’s father, a retired florist, provided and placed the beautiful roses. The top and bottom tiers were made of chocolate cake with two layers of raspberry Italian buttercream and one layer of white chocolate. The center tier was golden sour cream cake with two layers of strawberry Italian buttercream and one layer of white chocolate. White fondant encased the cakes. I also made extra side cakes identical to the main cake except iced in plain buttercream instead of fondant. They were sliced in the back room and never seen whole by the guests. I made everything myself, from the cake, to the fondant, to the fruit puree used in the buttercream. One of my smartass friends asked if I made the butter. I told her about my pet cow and butter churn, but she didn’t believe me because I was lying. (I have a lot of smartass friends. I can’t imagine why.) I didn’t grow the sugarcane or mill the flour either. I’m so embarrassed. There was enough cake to feed 560 people if you use Rose Levy Beranbaum’s numbers that assume traditional cracker-sized servings and many guests abstaining or 200 people if you use Dede Wilson’s numbers that assume real servings visible without a microscope and every guest partaking. I chose to go with Wilson’s numbers for the reception’s 120 guests. The bride’s brother had thirds—the ultimate compliment. All the boxed extra cake found homes without prodding. I consider that a compliment too. Up next: The groom’s cake and a bonus first anniversary cake.